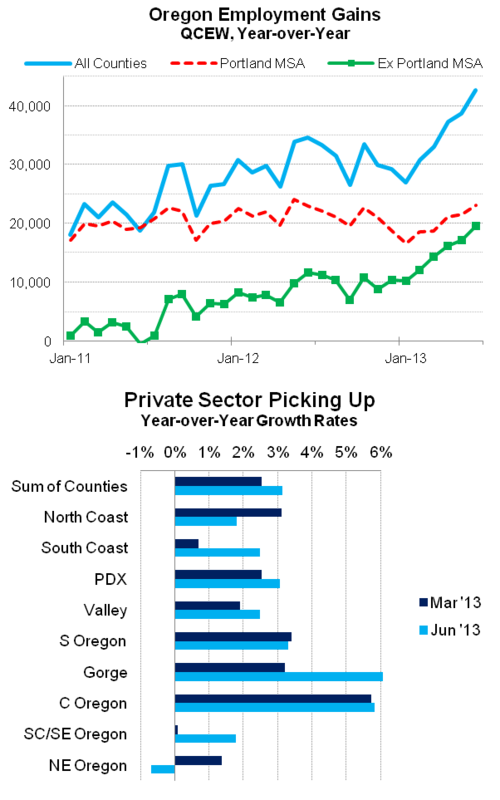 In recent quarters, we’ve noted how employment growth in Oregon has spread to regions outside of the Portland Metro. The good news is that these trends are strengthening even further and growth continues to accelerate, based on the latest QCEW data through June. Portland continues to add its 20,000 private sector jobs over the past year for growth of 2.5 – 3%, but the rest of the state is now adding nearly 20,000 jobs as well. What exactly is going on here and what can we expect? The four key words for this improvement are Housing, Government, Bend and Medford. While most regions’ growth has picked up even relative to 3 months ago, the largest overall improvements are seen in our two hardest hit metros: Bend and Medford. One of the key points our office has been making for the past few years is the impact of housing and government on the economy. In particular these two major industries play an outsized role in our smaller and medium sized cities, not to mention the more rural parts of the state. It’s not because these areas have so many of these types of jobs, but rather they have less overall industrial diversity (advertising firms and ballet dancers tend to be located in the larger metropolitan areas, for example). So goes housing and the public sector, so goes the local economy. Portland has been doing well economically for a few years now, but our baseline outlook called for an improvement in employment growth primarily due to improvement in the other parts of the state. The improvement in these areas was to kick in once housing and government were no longer economic drags on the recovery. We’re certainly at that point in Bend and effectively there in Medford (although public losses continue). Overall our baseline outlook calls for these growth rates to basically hold steady for the next couple of years before the longer run demographics weigh on net job growth. 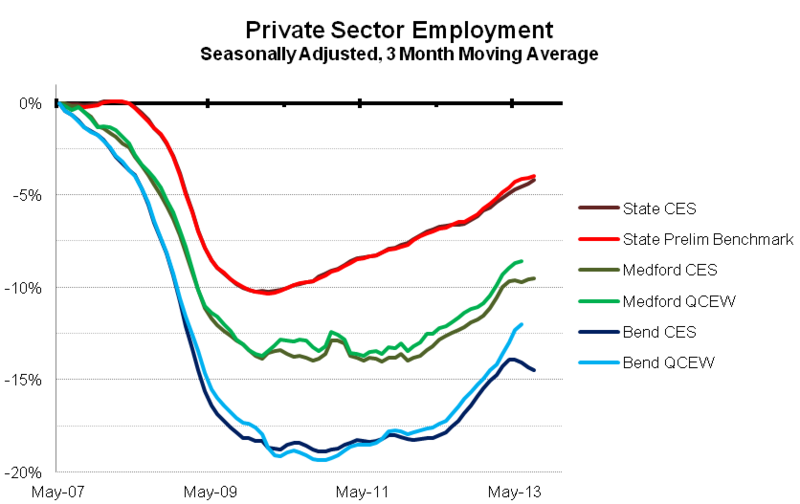 Maybe Bend won’t continue to grow at 5+% per year but the improvement in the statewide figures should, provided we do not fall back into recession in the near future. Based on the latest from the Wall Street Journal Economic Forecasting Survey, all the optimism amongst forecasters appears to have been stamped out due to the talk of the Fed’s potential tapering, rising interest rates, the federal government shutdown and no clear fix in Europe. However, there still remains upside potential to the outlook, particularly here in Oregon. We still have yet to see all regions improve substantially, even amongst our MSAs which are large enough to move the statewide numbers on their own. Eugene’s growth is still lagging the statewide numbers, while Salem is just now reaching the statewide average in terms of growth rates. 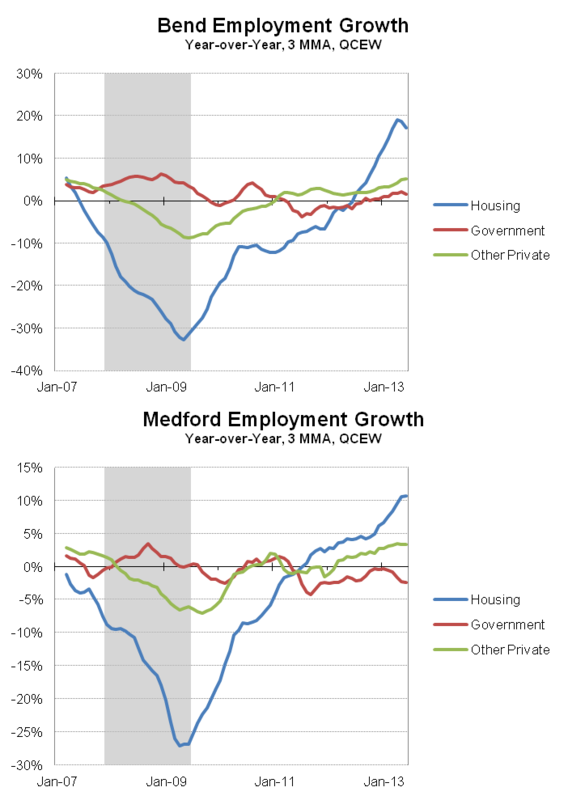 Should these two MSAs pick up, and the Portland-Bend-Meford trio continue at this pace, the overall rate of job growth in the state will be above forecast. More to come on the overall outlook later this month with our quarterly release scheduled for November 27th.